Art lesson ideas, tips, and general information for art teachers everywhere. This lesson is adapted from a lesson found on the Incredible Art Department website and the entire lesson may be found there. I will post my adapted version in this blog entry. 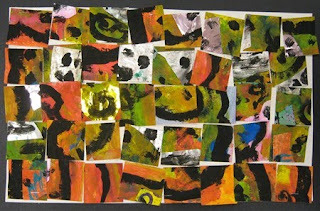 I have done this lesson with second graders, but it is adaptable to all ages and skill levels. Explain to students what Non-Objective Art is: "Artworks having no recognizable subject matter (not recognizable as such things as houses, trees, people, etc.) Also known as non-representational art" (from ArtLex). Show examples, if possible. 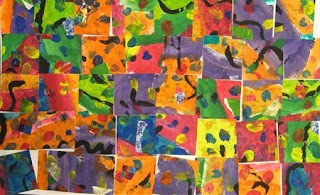 Students paint various lines, shapes, and patterns on their white paper using various colors of tempera (no black at this point). Stress that no recognizable items should be painted. 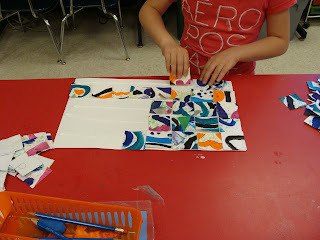 Students glue various scraps of decorative paper at random spots on their painting. Students use black tempera (or ink) to outline various shapes and add more lines to their painting. Using spray bottles filled with liquid watercolor, students mist their paintings to add even more color and texture. 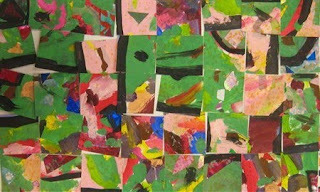 I use the paper cutter to cut their paintings in to 2" squares and place their pieces in individual envelopes. 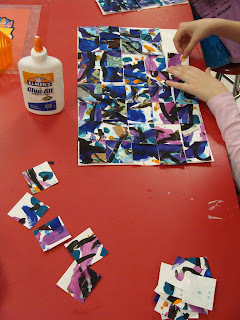 Students could also measure and cut their own paintings using scissors. 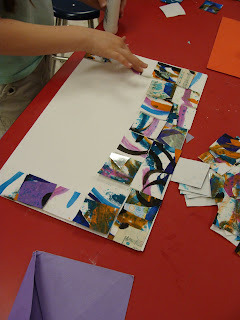 Students randomly glue their pieces on to another piece of white 10" X 16" paper, making sure they fit them back together without gaps or overlaps. I mounted these on to colored construction paper and they looked fabulous! 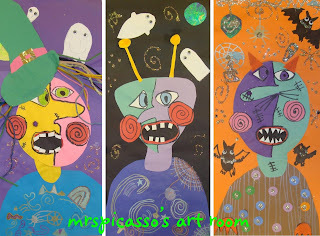 You can see all of my students' artwork on our Artsonia gallery. These look absolutely great! Thank you for the link to the Incredible Art Department too; I'd never come across this site before! These are gorgeous! I will definitely have to try this. Thanks for the post! I have been waiting a full year to post this project! Last year, I had to document all of the steps and by the time I did that, it was too late to blog about it. This is one of my second graders' favorite projects and it was adapted from a lesson that has been floating around the net for awhile. In that lesson, the kids all made witches, but I thought my kids would like more variety, so I came up with this. Art History: Discuss Pablo Picasso and share various examples of his cubist portraits. I show the video Dropping In On Picasso. I've been wanting to post about these for awhile, but Blogger kept rotating my photos. Finally, I figured out how to copy & paste them in from Picassa. Yay! 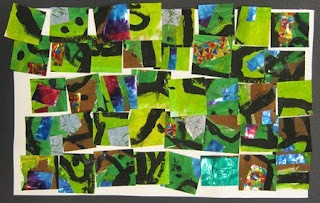 Warm & Cool Swirling Leaves I made these beauties with first graders. We first studied warm & cool colors and played a sorting game (pictured below). I laminated several rectangles of construction paper & added a magnet to the back. Students take turns coming up and placing their colors in the correct area. Yep, I admit it. I have stolen several ideas this year, mostly found on Pinterest. This tree is outside my art room and was inspired by a photo found on: Project Nursery. I love the way it turned out, but it took me four hours to create! To go along with the polka dots on the tree, I used this idea from Art With Mr. E.
I then added this phrase that I found on Mrs. Malone's Art Room. I have had lots of positive feedback on this door! Since I was loving the dots, I added some to the front of my desk. Here is the corner I posted about previously. This idea is all my own... I think! I added wings and the phrase, "Time Flies When You're Making Art." Yep, stole it from Mrs. Knight's Smartest Artists. I don't know whose idea this is, but I found it on Pinterest. I am in my 23rd year of teaching art in the same school district. I love being an art teacher!